Talking to Barry Jenkins is something I wish could last to for ages. What’s interesting is learning that his follow up to the Oscar-winning Moonlight, If Beale Street Could Talk was written on the same writing trip he took to Europe. It was through an ex-girlfriend that Jenkins first became acquainted with Baldwin and his novels, but when he discovered If Beale Street Could Talk, it seemed inevitable that he would write the adaptation. If Beale Street Could Talk is filled with absolute knockout performances from the entire cast. Kiki Layne is determined and devoted as the pregnant Tish who fights for her boyfriend’s freedom as he sits behind bars for a crime he didn’t commit. Her baby’s father Fonny (Stephan James) is resilient, stoic, and unwavering. Regina King as Kiki’s mother Sharon, and Brian Tyree Henry as Fonny’s friend who delivers a 12-minute scene about incarceration both command their scenes when they’re onscreen. It’s not just the performances that are intensely heartfelt, it’s Jenkins’ visual language, reuniting with his Moonlight creatives to turn that soaring language of Baldwin’s words into swooning imagery. I caught up with Jenkins to talk about how he wrote Beale Street and asked him what scene was the most personal to him. I saw you moderate the panel for Blindspotting and I have to say you need to moderate more panels. You know, that’s what I do at Telluride and that’s why so many people know me as a moderator. That was before I made Moonlight. I wish I could do more of them. We all have a personal connection to James Baldwin and we all started somewhere specific when it came to discovering his works. What’s yours? I was in undergrad and dating someone who was more well-read, more worldly, more beautiful. When she broke up with me, she recommended. I read James Baldwin. We’re still friends and it was clear we were going to be friends. She suggested I read Giovanni’s Room and The Fire Next Time. I had never really heard of James Baldwin so it was a purely new discovery for me. I was just moved with the passion and the sensuality of the writing with both the fiction and the non-fiction. To be honest, I was just quite proud that someone that looked like me had written these amazing things. What was it about Beale Street that made you want to adapt it? You wrote this while you wrote Moonlight? I did. It was on the exact same writing trip in the Summer of 2013. I went there to write Beale Street. I took Tarrell’s play with me and the idea was I was going to adapt the James Baldwin novel which was going to be just an impossible task. I thought I’d take Tarrell’s play and start with that first because that will be easier for me to get going writing because I hadn’t written anything in over a year. Moonlight came together so quickly and I wrote the first draft of that in about ten days. That was in Brussels and I left there. I thought to myself, let me have another James Baldwin experience and go to another European country and adapted Beale Street. As far as what it was about the novel, I hadn’t read that. What I loved about it was just this idea that it captured the dual voices of Baldwin so well. It was so rich and dense about passion and romance. Love that’s both physical and emotional. In this book, you have these two characters who are soulmates. On the other hand, you have the Baldwin of the non-fiction that was really critical of American society and the role it played and the degradation of black folks. I felt that those two things were just so organically fused in Tish and Fonny’s story. Even though it’s not my favorite story by James Baldwin, it was the one that felt the richest as far as applying my voice as a visual storyteller to the emotions and themes to James Baldwin’s work. What struck me about this was that he wrote it in the ’70s but it’s a story that is happening in America today. It’s a news story we’re still seeing today. It resonates across half a century. For me, when I wrote it back in the Summer of 2013. Even back then, I felt this connection to Tish and Fonny in a very strong way. Baldwin does this really wonderful trick. Their love is so pure and something about them is so innocent and to have that thing corrupted by happenstance, by this dark fate. There was something about it that really grabbed me. Even back then, before making Moonlight, I knew it would be difficult to get this thing made because no one knew who I was. I can’t make this for $12,000. I thought why not make it a little bit less difficult and reset it to the present day because all this stuff can very much happen tomorrow. Then I thought about the power in what he was writing about was how pervasive so many of these problems have become. Much has changed, but not much has changed since 1974. It was very clear to me was that, with Baldwin, his work was about a truth that was so undeniable that there was no expiration date on it. Your casting is a revelation. Both leads are such a discovery. I was aware of who Stephan was. I’d seen him in Selma and as Jesse Owens in Race. Fonny is a very interesting character in both the book and the film. I think in the film, the character spins a little bit differently in the sense that he has to have this vitality that is so readily clear and apparent. We talk about Tish as being innocent because Kiki plays her that way. She’s experiencing so many things for the very first time. The idea is that Fonny has more of a worldliness to him. I think Fonny is as wide-eyed as Tish is and there’s a vital energy within him and that was the primary thing I was looking for. Stephan sent a tape in but I had this idea in my head that he was too polished, too refined and had too much technique. I wanted somebody raw and rough around the edges. But I sat down with him and told him those things. He said that he would put every scene in this film on tape. I told him to put two scenes together and he went off in that direction and he did. What about Kiki and finding her to be your perfect Tish? Her tape came in last. We saw close to 400 women. I’m sure Cindy Tolan’s scouts saw more than that. Once I saw Kiki’s tape — and for me, there’s no difference between the most experienced and the least experienced — there are plus and minuses to all of them. When you’re casting someone like Mr. Rogers, casting Tom Hanks is a good thing because Mr. Rogers is so familiar so why not cast someone who is familiar as well. On the flip side, there’s an added bonus sometimes in a character appearing on screen and the audience having never seen them before. In Moonlight, never having seen those guys who play Chiron is really a plus. With this, it wasn’t so much a concern. I was looking for an actress who had this duality of experience where so much of what Tish is experiencing, she is experiencing for the first time. I wanted somebody who could have this very lush innocence in a certain way and this naivete. In the voiceover and later scenes, clearly Tish has evolved into a woman and she’s been deeply affected by these experiences. Kiki has that duality. People watch the film and assume that Stephan is so much older than her. Kiki is actually a few years older than him. It’s called acting. Talk about collaborating with your team again. You got back to your student days with James. It’s always nice to work with people you trust and people who trust you. I think it’s not so much about working with people who agree with everything I do or decide, but more so people have the patience to allow myself and the other collaborators to explore and to try things. Not everything works, but in our failures, we discover things that prop the film up. We brought back the same team from Moonlight. There were so many things in Moonlight that both myself and James in the visuals and in the editing we tried. We tried them out of fear. It was nice to come back into this film with that experience and have the confidence to make some of those more adventurous choices. Instead, we made them out of curiosity and wanting to explore. It was lovely in production and post to have the people who are close to me and have known me for so long. That way when something comes in or if I make suggestions or the suggestion is made to me that’s way outside the box, nobody panics. They realize they can come back to the very safe and known place, but also let’s go down this path and see what it yields. Was there anything where you did that? When we first came into post we threw the script out. I thought it would be a nice experiment because the book is not linear, the script is not linear and the film itself is not linear. I thought maybe there’s a different structure now that it’s not in my head and it’s in the actor’s bodies and there are actual scenes. I thought let’s really throw the script out. What ended up happening over the course of post-production was that we just got closer and closer to the script. You can chart our whole production process and it’s us slowly working back to the structure of the script. There are one or two things that originated in that very first let’s break it session that maybe we wouldn’t have arrived at had we worked the other way around. Was there a scene that was particularly personal to you? I would say it’s a simple scene. After the scene in Puerto Rico. There’s an almost fantasy sequence where Stephan’s character, Fonny is lying in his jail cell and he’s having this vision of himself and his work. There’s a block of wood and he’s a sculptor. he’s in his basement flat and there’s this superb vibrant source of light beaming down through the ceiling. He’s approaching this work and he can’t quite reconcile it. Essentially over the course of the film, he’s in purgatory. The unborn child is in purgatory. For me, that was what it was like to create art, especially having the background that I have. I saw so much of myself in that moment in particular. I remember being on set and whispering to James that this is what it feels like to make these films. There’s something really potent about that to me. The scene with Brian was so powerful. It’s such a core moment of the film foreshadowing things in a way. Even at the script stage, I knew that scene needed to have a certain potency and agency. Brian’s character is not one of the main characters and he’s not a driving force in the film and yet because the dialogue is so rich and in the source material – that scene in the novel is broken up into two different parts. You get a part of it, you go away from it and then you come back to it. I thought it needed to more or less be the halfway point in our journey and it needed to arrive whole and intact. Once you’re in it, you had to be in it. Casting it was really crucial. you have all these satellite characters, characters who appear for five or ten minutes and they disappear. Not quite as extreme as Mahershala’s character in Moonlight, but similar in a certain way. casting this was so crucial because as you say it’s a foreshadowing. It’s not literal foreshadowing, it’s not textual, it’s almost psychological in a certain way. I wanted someone who could sit across from Stephan James and have the same kind of power, the same vitality and same lifeforce that Stephan has. Over the course of that scene, you very organically see that lifeforce drain away and you see it replaced by this much more torturous and much darker thing. This trauma. It was a really important scene in the script and once we cast Brian, I knew we’d have a day to shoot that. What I see when I see that scene is we filmed that and by that point, it was our last day of production in New York. It was Stephan’s last day, it was Brian’s only day before we relocated. The crew by then was a well-oiled machine and Brian showed up and because he loved the source material so much he knew exactly who his character was, we were basically done by lunch. But I felt it didn’t have the energy that I felt when I read the text. What I mean by that was what I could see in my head being cut together as a scene wasn’t carrying the energy I felt was needed to be successful. So, we were shooting two cameras. So James and I decided to take one camera off the set. Instead of building a set where you have to cut between Brian and Stephan we put the camera on a slider and we started panning the camera from one to another and that way as the energy in Brian changes, you see him pass that energy onto Stephan. Stephan takes it and then he gives it back to Brian. To me, it joins the characters that instead of it being a foreshadowing, you can see how the energy in Brian’s character has shifted and how that shift is very easily going to make its way into Stephan. It’s one of the scenes I’m most proud of. Talk about working with collaborators. To sit down with Joi and Nat and say, “For 12 minutes, we’re going to pause the film and Brian Tyree Henry is going to show up and they are going to talk for 12 minutes.” It takes a lot of faith. Like I said, we’ve all be doing this together for so long that no one blinked. It’s really the bedrock of the film and falls right at the halfway point. That and Puerto Rico. That scene hits you. My apologies. I don’t mean to be hitting people. [laughs]. 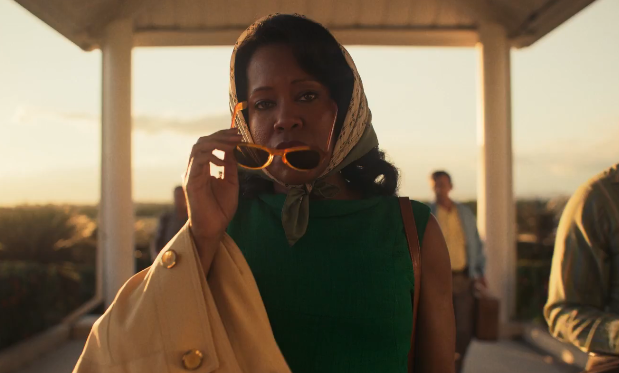 Let’s talk about the casting of Regina King and shooting that scene. She is someone who I’ve always been aware of. I kind of like to think I grew up with Regina King watching 227 as a kid and always being more or less in love with Regina’s character in that show. Through the years, spotting her here and there in all these roles and features. There was a period where she kind of went away from the multiplex. After making the film, I looked her up and I realized she hasn’t done a feature film in so long. I think part of that, for Regina – the challenging work that was going to expand who she was as a performer – those roles were in TV. Just like with casting Tish and Kiki became my Tish, it’s all a meritocracy. I was like, “I don’t care what you’ve been doing. I needed to find this mother who can carry so much weight and at the turn of a dime – when she’s sent off on this mission that no one should have to go on by themselves, you see the burden and the strain. I felt Regina had those things in spades. Tish and Fonny are basically the same age as her parents when they met and they fell in love. There’s this generational mirror and you like to think you can give your children a better world than the one that was given to you. What I love about Regina’s performance in this film and even looking at her, you can see that and the harsh reality that maybe it’s not true. When her character goes to Puerto Rico, we give the film over again, for fifteen minutes to Regina King. You can see the embodiment of all that weight and the impossibility of giving the children a better world than what was given to us. Regina was great. I remember the first conversation with her. I was in Montreal and she was in Mexico. She had read the book. She had the script and she was asking me all these things about why something was not in the script but in the book. I loved the book and said she could put it into her performance. I’ll even say, the thing with the wig. I knew it had to be in the film and it was always in the script, but I was going back and forth with it. In the book, it’s a shawl going over her head, but Regina said it needed to be a wig and that’s collaborating. Extremely strong words. Extremely strong. I think the film is contained, but there are many more strong ones left in the novel. Where do you draw that line because they’re so strong and so powerful? Even though your film is just as powerful and strong. I think part of it was really understanding that the book belongs to Baldwin, but the film belongs to Tish. There are times when his voice and Tish’s voice fuse. We tried to be as diligent as possible allowing her voice to filter through. There are a few places where we had voiceover early in post-production but we took the voiceover out because it was veering too far into his voice and out of hers. The film is not serving to replace or replicate the book. It is a work unto itself. As rich as people find the film to be if you go to the source material, there’s much more richness to be had. I think it was really important to know that I don’t have to cram everything in here. There’s an aesthetic contract that the work creates for itself and I think the aesthetic contract for this film is different than what Mr. Baldwin set for himself in the novel. So, I felt comfortable with not going all the word with some of the things he said in the book because of some of it…phewww…oh my goodness. We still go pretty far. I’ll say this. I did not curb the language in any way, I thought some of it was better read than said. Underground Railroad. How’s that going? We did scouting a couple of weeks ago. The script is in front of me and it’s all coming together. It’s nice to have something else happening while we’re talking about this.